As the Tax Cuts and Jobs Act brings the most sweeping changes in the tax code in over 30 years, the 2018 tax season is going to be a roller coaster ride for many. 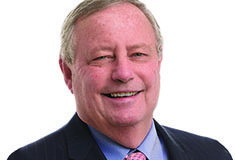 Tax professionals are scrambling to learn all of the implications for both individuals and businesses as the season gets into full swing. How this affects you, the commercial real estate investor, and what you should be aware of before making your next real estate purchase, is detailed below. We also rate the tax changes between 2017 and 2018 as Good, Great or Ugly. Depreciation is beneficial in maximizing a property owner’s tax savings and increasing their cash flow. To allow businesses to recover their property costs more quickly and stimulate the economy, Congress introduced an incentive called bonus depreciation in 2002. This allows owners to deduct an additional percentage of the cost of an eligible property (or property improvement) in the first year the property is placed in service, before their standard depreciation method is applied. However, the IRS has strict definitions of what “personal property” (such as carpeting or wallcovering) or “land improvements” (such as sidewalks or site lighting) can qualify for this bonus. Specific qualifying assets can be identified through an engineering-based cost segregation study. In 2017, owners were eligible for 50% bonus depreciation. The catch – the incentive only applied to new construction projects, leaving those who bought existing properties out in the cold. The new tax act gives owners two new opportunities to increase the return on their investment and lower their tax burden. First, it increases the bonus depreciation allowed from 50% to 100%, allowing owners to fully expense the costs of a qualifying project in the first year rather than having to depreciate them over many. Second, property acquisitions now qualify. This means great news for many more property owners in 2018. 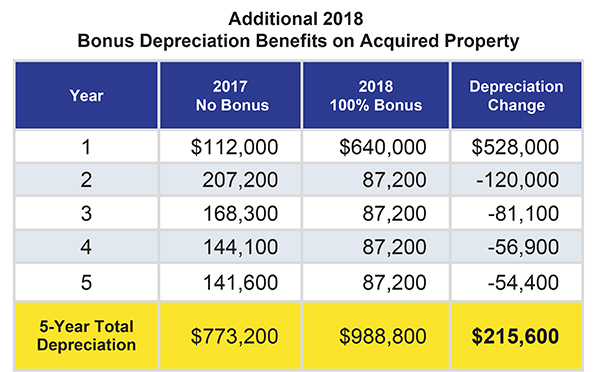 The table below illustrates how the new tax law will benefit a property owner who buys a $5M office building, compared to prior years when bonus depreciation didn’t exist for acquired property. Both illustrations assume a cost segregation study was performed to maximize the overall depreciation. As shown, those acquiring existing properties now enjoy a huge depreciation (tax savings) increase in the year of purchase due to the bonus. This dramatic first year change will materially impact how investors view their real estate purchases. A building or building improvement is defined as “qualified restaurant property” if more than 50% of the building’s square footage is devoted to the consumption of prepared meals. 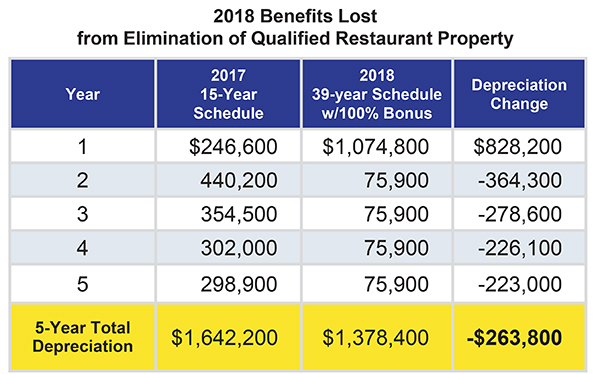 Restaurants enjoyed a 15-year depreciation schedule instead of the typical 39-year schedule required for “real” property. This favorable tax treatment did not apply to most other types of buildings or building improvements, and made restaurants a favored asset class for many investors. Under the new law, restaurants no longer qualify for the reduced depreciation schedule. Owners may benefit more in the first year than they have in the past due to the new 100% bonus depreciation. However, as shown in the table below, in subsequent years they will be significantly worse off since they can no longer depreciate the entire building over 15 years. Definitions of these two items are similar with subtle differences. QIP refers to the cost of interior improvements any time after the date that the building was first constructed. To qualify as a QLI, the improvement must be made at least three years after the building is constructed, and must be for a tenant space (typically within an office or retail building). The QLI deduction benefits whoever makes the improvement - either the landlord or a tenant. In 2017, QLI was eligible for both a 15-year depreciation schedule and 50% bonus depreciation. While QIP had to adhere to the longer 39-year schedule, it too was eligible for the 50% bonus. While not as great as the deduction for QLI, QIP savings were still a better deal than what was around the corner in 2018. The new tax act simplifies and consolidates the various property improvement categories to a single category called QIP, which eliminates the QLI category along with its benefits. QIP costs must now adhere to a 39-year depreciation period, without any bonus depreciation – hurting all who in past years enjoyed the benefits of the previous code. This section of the tax code allows property owners to deduct the full cost of qualifying equipment / property (carpet, wallcovering, etc.) as an expense during the year it was purchased, rather than requiring the cost to be depreciated over time. In 2017 and years prior, 179 expensing limits were set at $500,000. This expensing incentive encouraged many investors to improve their properties. The new rules will allow most small/medium-sized property owners to write off the entire cost of qualifying upgrades and equipment bought in 2018. These changes will make a big difference for many more companies. Section 179D primarily enables all commercial building owners to claim a deduction for installing energy-efficient systems (such as interior lighting and heating/cooling systems) or modifying the building envelope to reduce energy costs. To qualify, the building’s total energy and power cost must be cut by 50% or more in comparison to a building meeting minimum industry standards. The incentive, which went into effect in 2006, was extended yearly up to and including the 2017 tax season. This deduction encouraged property owners to invest in energy-conscious construction and improvements. The jury is out on this one. The big question is whether it will be extended for 2018 since the incentive expired in 2017. However, signs are pointing to a retroactive extension during Congress’ 2019 session, so investors and their tax professionals need to keep a watchful eye to see whether it actually will get passed. So, who exactly wins and loses as a result of the Tax Cuts and Jobs Act? Owners with tenants, restaurant owners, and those thinking of making energy-efficient improvements look to be holding the short end of the stick when it comes to reducing their tax burdens in 2018. However, the increase in bonus depreciation, expanded definitions of items and property eligible for 179 expensing deductions, as well as the significant boost in expensing limits will help soften that blow for those who know exactly how to take advantage of this year’s changes. 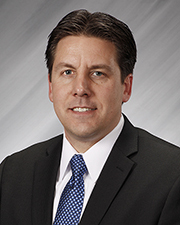 Robert Rahner, CFA, ASA, CCSP, is the managing director of Cost Recovery Solutions LLC, Tinton Falls, N.J.